If you’ve been reading this blog for a while (thank you!, BTW), you’ll know that pasta is my favorite (well, Italian food in general). If I could eat Italian food all day, er’y day, I would. The Americanized version of Italian dishes aren’t known for being the healthiest (Curse you, carbs! ), so that isn’t ideal. Luckily for all you fellow pasta lovers, we’ve found some pretty yummy alternatives for the dietary-conscious. Here’s a recipe for penne pasta and a quick & easy pasta recipe. Nikki’s favorite pasta dish is Fettuccine Alfredo. She’s been on a search for noodles and sauce that she can digest without disturbing her digestive system. Whilst shopping at Healthy Home Market (a local health & specialty foods store), we discovered DeBoles rice fettuccine noodles. *clapping hands emoji* As you’ll see from the recipes above, we liked their spaghetti noodles. These noodles are made of brown rice. Learn more about DeBoles here. Don’t be turned off by the fact that these are made from brown rice. On the same aisle we found a variety of pasta sauces. Most white sauces contain soy (-__-). Fortunately for us, Healthy Home Market has a GFS-approved white sauce. 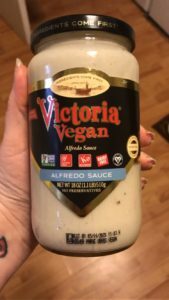 *more clapping hands emoji* Victoria Vegan Alfredo Sauce is Certified Vegan & Non-GMO Project Verified, and Kosher. Victoria Fine Food Product Lines began back in the late 1920s & many products came from family recipes. They offer six vegan sauces. We kept the dish simple, partially because Nikki didn’t have broccoli & I don’t ingest that stuff. Nikki doesn’t like chicken in her fettuccine alfredo, so there you have it. Along with the pasta, we also had garlic bread. Nikki made some for my mom & I using bread that we can eat. 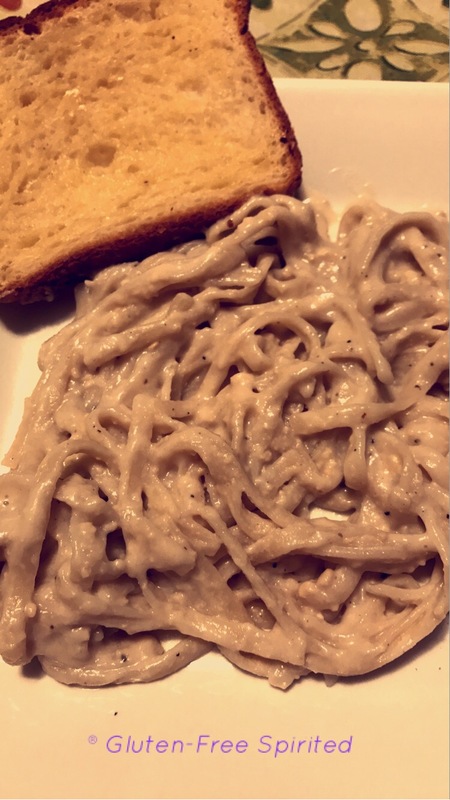 She made hers with a bread she recently discovered (shoutout to an Instagram follower for the recommendation!) called Canyon Bakehouse. She has the Mountain White loaf. Along with being Certified Gluten-Free, it’s also No GMO, Kosher, and nut free. On all of the bread she toasted, Nikki used Smart Balance Soy-Free butter and garlic salt. We enjoyed the pasta. The sauce was a little tart (I guess that’s the best way to describe it), so we added garlic & onion salt which really helped the taste. Broccoli and/or chicken may also help mute the tart flavor. *Homer Simpson voice* Mmmm, pasta. If you like this recipe, you might like recipes for: pancakes, birthday cake, and cheezy mac. If you haven’t utilized the snazzy new subscribe pop-up, subscribe below (I promise not to spam you & only let you know when there’s a new blog). Don’t forget to follow GFS on social media & to share this blog with other cool people. ? This looks awesome! 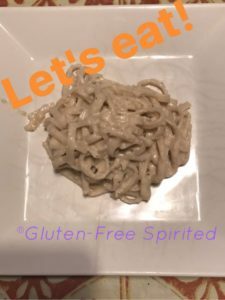 As someone who can’t really eat gluten I kind of just rule out pasta most of the time, you’ve reminded me to look for alternatives 🙂 Great post! This is perfect. I have a friend who is suppose to come over for dinner next week, She is Vegan and I am not, so I’ve been scouring the web trying to find anything that would be appealing to hear and my children (plus myself) and really there are a lot of products out there but everyone seems to always just say yeah it’s good and then don’t elaborate. I’m glad that you mentioned it’s tartness and suggestion on how to cut down on that. Cia, I’m so glad that this recipe will you help you out! It can be hard to find something everyone will enjoy. We were caught off guard by the tartness & wanted to make sure I mentioned it so no one else is surprised. 🙂 Let me know what everyone thinks! LOL now you don’t have to feel guilty if you have a larger portion or go back for seconds! Lately I’ve been noticing that my body doesn’t like it when I consume too much gluten. Makes me sad. I found these frozen pasta meals in Target (in the veggie section) that have ‘pasta’ made out of lentils and zucchini. It has been a saving grace! I will need to try this recipe as well. We feel your pain! I’ll have to tell Nikki about the frozen pasta meals at Target. Let me know if you try this recipe & what you think! I really like these noodles! It really can be difficult to find stuff that meet her restrictions and appeal to her taste buds, but she’s finding more & more food that fit both needs. I am always looking for gluten free recipes! I have suffered from migraines since I was 12 years old. I was always on some kind of medication to either prevent them, or on something when I got them. I finally found a doctor that recommended changing my diet to gluten free. Such a life changer! Thank you so much for this post! I am pinning for future reference! Thank you for this great recipe. I am always happy to find out new recipes that are gluten-free. I’m happy to hear that, Courtney! Let me know if you make it & what you think! This looks really tasty. Thank you for sharing, I want now to make it for dinner. I’m not gluten free but I am diabetic so this recipe actually is very appealing to me because I can’t have regular pasta…. This looks yum. I love how there are so few calories and carbs in the sauce! Most pasta sauces I come across are packed with carbs . 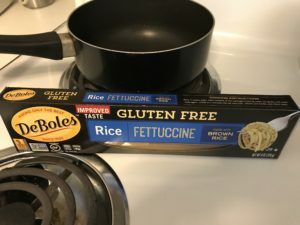 Carbs can still be an issue with gluten-free diets, but I was very pleased (and surprised!) to see that this sauce was so low! I can’t believe how little calories there are in your Fettucini Alfredo, that’s why my mom and I are trying the gluten free diet to get healthier! Wow noodles made from brown rice. Sounds great and a great way to eat pasta if you have food restrictions. I was a little skeptical at first when we tried their spaghetti noodles made from brown rice, but I really like them a lot. I knew their fettuccine noodles would be good. 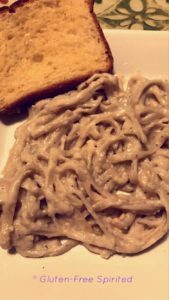 LOL it’s so yummy (alfredo is in general)! It is so important to realize that there are alternatives out there. I am sure people will dietary restriction will appreciate this recipe. This looks delicious! I’m glad you were able to make your favorite dish gluten free. This dish looks so tempting. I really like it because it’s gluten free. I will definitely try to make this fettuccine alfredo. I am sure that my love ones will love this so much. Hey babe, I recently encountered a similar problem as yours – yellow/ orange photos under indoor light and found a solution. So thought I will share with you. If you have photoshop, use the Photo Filter function and opt for Deep Blue or blue options to remove the yellow in the photos! Thanks for the tip, Tiffany! I don’t have Photo Shop though. I generally use Canva. Great tips and food alternatives. I have a lot of food issues, so I appreciate this a lot! 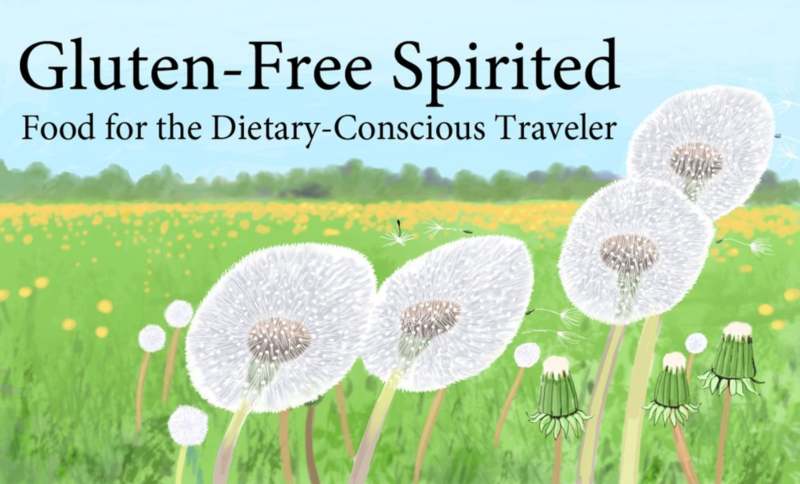 Thena, I’m glad to hear that you find these tips & food alternatives to be helpful!